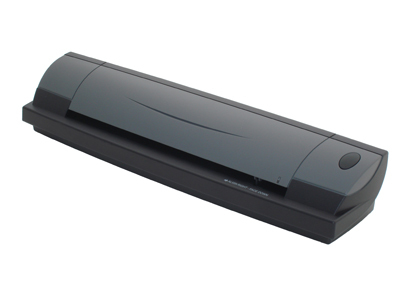 The DocketPORT 488 – Simultaneously scan both sides of a document, driver’s license, identity or insurance card in one pass with this duplex professional grade color document scanner. Simultaneously scan both sides of a document, driver’s license, identity or insurance card in one pass with the DocketPORT ® 488 duplex professional grade color document scanner. The 488 adeptly handles the most challenging scan jobs, even cards that are laminated. Because it runs on USB power, it needs no outside electric source, and a small footprint means it uses far less space than traditional flatbed scanners. One-button scanning allows users to capture images quickly, and PDF, JPEG and TIFF format options make for easy digital filing and integration. TWAIN compatibility means the DocketPORT ® 488 is compatible with hundreds of software applications. And the inclusion of document management software gives users simple, one-click scanning presets and intuitive, drag-and-drop organization. A truly mobile duplex (2-sided) scanner from the people who first brought the technology to market. This pro grade scanner will earn its place as your ultimate travel companion. Takes up far less space than comparable flat bed and ADF scanners, making it the choice for users with limited space, perfect for both laptop and desktop users. No power cord to pack, the USB power from a laptop is all that’s needed to capture that document on the go. The instant warm-up feature gets you scanning fast. We built it to last under tough conditions. Durable and reliable for frequent and continuous use applications on the road or in the office. Scan both sides in one pass of laminated cards like IDs, driver’s licenses and insurance Cards. Included software conveniently delivers industry-standard PDF output, as well as autocrops and deskews automatically.